Microsoft recently lifted the NDA on Dynamics 365 for Marketing and it is now in Public Preview: you can try it yourself here. Microsoft did a very good job at documenting the solution on Microsoft Docs. You may get a little confused as to which marketing automation solution to choose for your Dynamics 365 Customer Engagement deployment between Adobe, Dynamics 365 for Marketing, and ISVs such as ClickDimensions. Dynamics and Marketing... wait a minute! Now this is not the first time Microsoft launches a Marketing product. Remember Microsoft Dynamics Marketing (MDM)? Microsoft had acquired MarketingPilot in 2012 and launched it as Dynamics Marketing. Unfortunately, it was a failure. It never really got much adoption due to its limited integration with Dynamics CRM and even though it covered a broad functional scope, it was quite complex for end-users. As a result, Microsoft decided to discontinue Dynamics Marketing as of May 15, 2018. These last years, Microsoft has been hard at work to fill the gap with a Marketing offer for its different segments of customers: Adobe integration for large enterprise scenarios, and a new Marketing solution for more simple needs. At first, Dynamics 365 for Marketing was only meant to be available to small businesses with a limit on the number of users, but this seemed to have changed since last summer. OK. So what has changed with Dynamics 365 for Marketing? 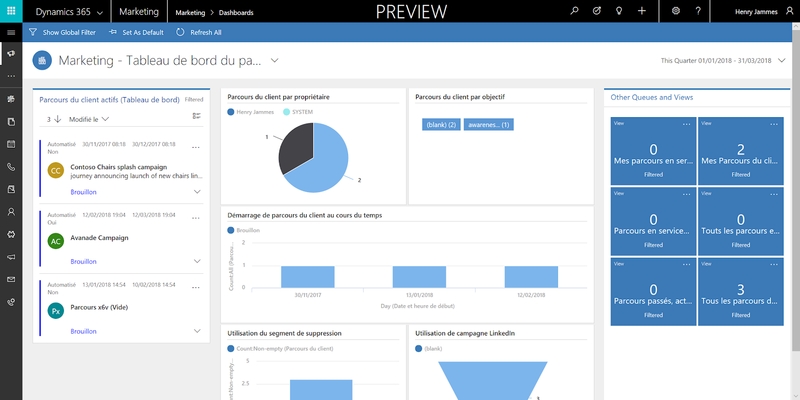 Well for once, it is built on the Dynamics 365 Customer Engagement (previously known as Dynamics CRM) platform, leveraging familiar UI and extensibility options. Now this should ring a bell... Other ISVs have done the exact same thing. 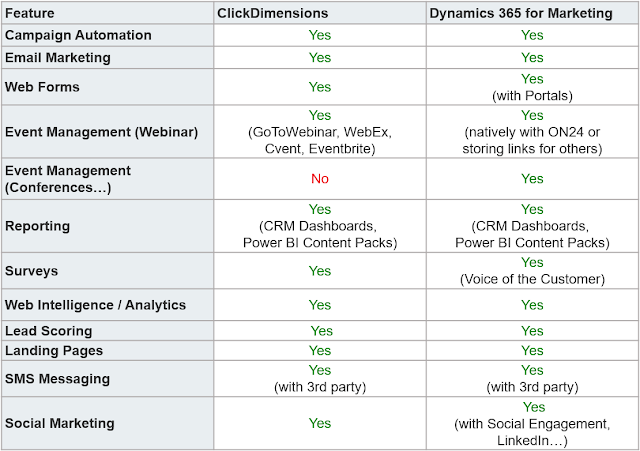 ClickDimensions is one of the most famous Dynamics 365 Customer Engagement add-on for marketing, and it is completely integrated with its own custom entities and logic, leveraging services sitting in Azure to manage want can't be done in CRM (emailing delivery at scale, web forms, landing pages, web analytics tracking...). But, by default, almost all ClickDimensions data sits in the CRM database. And that's one of the issue with such solutions: it literally fills the database with behavioral data. And even though it is scalable (even more so now that it leverages Azure SQL since v9.0), the CRM database was never really meant to store large volumes of behavioral data. Instead, it was more meant to store a customer database with associated transactional data related to sales or service processes and customer interactions (appointments, phone calls...). Storing behavioral data can rapidly grow your database to very large volumes, especially if you start tracking emailing deliveries, clicks, or website browsing. And Dynamics 365 storage is not known to be cheap: extra storage is billed around 10 $/GB/month (the good news being you get 5 GB free storage for every 20 user licenses). ClickDimensions has introduced an option in 2016 to mitigate that issue. This new architecture allows to partially synchronize events with the Dynamics 365 database, and leverage an Azure SQL statistics warehouse instead. What does Dynamics 365 for Marketing do differently? Microsoft has built Dynamics 365 for Marketing with the future in mind. So in short, Dynamics 365 for Marketing uses the Dynamics 365 Customer Engagement as its foundation for integration, where you will find your contacts, customer journeys (for marketing automation), emailing templates, segments (marketing lists) etc. but the heavy works (advanced segmentation, smart matching, customer 360° view that leverages all kinds of data sources) is done in Customer Insights. Dynamics 365 for Marketing also leverages other existing components to offer a very complete set of features: Voice of the Customer for surveys, Portals, LinkedIn Lead Gen Forms, etc. How do they compare in features? First, you should know that Dynamics 365 for Marketing is still in preview (some say it will hit GA in April 2018) while ClickDimensions has been around since 2010 and has a well established situation and a strong customer base. So you shouldn't rush. In terms of pricing, there is still no information on what Dynamics 365 for Marketing will cost, and this will certainly be a major criteria. 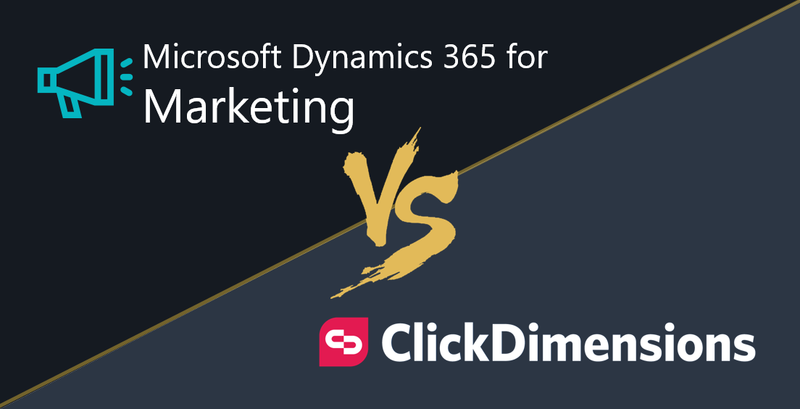 Technology-wise, Dynamics 365 for Marketing was built with the latest cloud technologies available when ClickDimensions inherited design choices that were driven by earlier versions of CRM and their limitations. Nonetheless, ClickDimensions offers very regular updates and has a rich roadmap for the future. Even though both products tend to have a similar functional scope, I believe Dynamics 365 for Marketing has a more "future-proof" architecture and will be better scaled for large volumes of data and complex 360° customer view and dashboards. Wait & see!